“Healthy Thanksgiving” isn’t really something you hear every day. Everyone knows that Thanksgiving is the biggest dieting pitfall of the year. It’s the time of year that we tell ourselves that we’re going to make good, healthy choices. We go into dinner with the best of intentions. Then Aunt Ruth asks why you aren’t married yet. And Grandma brings that obnoxious yappy dog that doesn’t like children with her again. And your sister shows up with your ex. And Uncle Al and Aunt Betty are screaming at each other about who forgot the egg nog. So you tell yourself that comforting yourself with one spoonful of stuffing with gravy is a good idea. But one spoonful leads to another. And extra butter on those mashed potatoes. And pie. And wine. It wouldn’t be much of a list if we skipped dessert, would it? 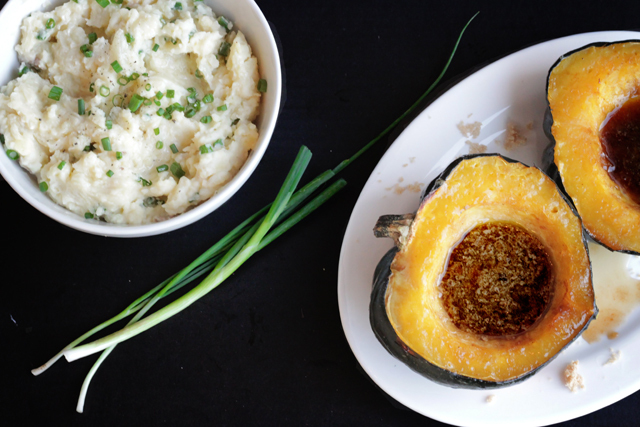 Do you have a favorite healthy Thanksgiving side dish idea? I’d love to hear it! Share the love: No antibiotics necessary. I am looking forward to reading your blog enteries! I like the idea of “healthy” vs just overeating on Thanksgiving, makes it much more enjoyable. I love your recipes! The Fig and Pancetta Stuffing sounds awesome! well, i missed it for thanksgiving but i would love to make these on a regular day! I love some of these side dish ideas. I’ve never thought of turmeric cauliflower. Yum, I think I’ll have to try some of these soon even though Thanksgiving is a long way off! There are so many great recipes on here! I look forward to maybe trying some this weekend as I think they could be used for an Easter family gathering as well. This site participates in the Amazon Services LLC Associates Program, an affiliate advertising program designed to provide a means to earn fees by linking to Amazon.com and affiliated sites.